North Texas was hit by a large squall line Thursday that resulted in numerous reports of damage in the Dallas-Fort Worth area according to The National Weather Service. The preliminary NWS count shows 47 reports of hail, 92 severe wind reports, 67 different reports of thunderstorm wind damage and 25 direct observations of wind gusts over 58 miles per hour. While there were unconfirmed reports of tornadoes Thursday, the National Weather Service says all evidence suggests that straight line winds are to blame for the damage across North Texas. Looking at damage evidence the NWS found in Tarrant County, wind speeds were likely around 80 mph in Fort Worth, while in Arlington wind speeds were closer to 90 mph near the University of Texas at Arlington campus and at Arlington Baptist College. In southwestern Dallas County wind speeds were estimated close to 85 mph. 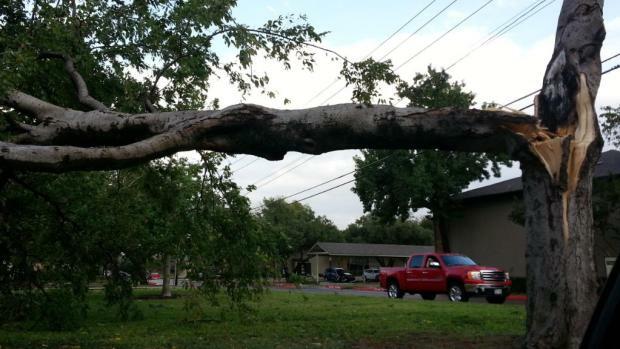 Garland and Lake Ray Hubbard experienced winds at 70 to 80 mph. At the top of a broadcast tower at Cedar Hill the winds were near 100 mph. As for Rockwall County, the NWS says wind speeds were strongest near Fate, where observations and radar data suggest wind speeds of 70 to 80 mph. Wind speeds were close to 80 mph near Terrell in Kaufman County.